When a bestseller afterlife novel turns into a total fiasco. The fake bestselling novel of the moment has been written by a six year old boy, ladies and gentlemen! The teenager, Alex Malarkey, who has been through a car accident that has left him paralyzed, elaborates on his two months spent in a deep coma. While the entire nation was touched by this testimony, the writer recently admitted that the entire story was a lie. Yes, you heard it right the first time! The scandal is generating a lot of critics, urging the publisher, Tyndale House, to pull out all the existing copies from the stores. Ourpastime.com investigated on the topic to shed some light on this unbelievable turn of event! You might be confused and I would not blame you for it. Indeed, in a nutshell, Alex Malarkey, a little boy from Ohio was the victim of a car accident that left him paralyzed and in a deep coma for two whole months. When he woke up, the little boy attempted to put down on paper and convey his experience of these two months in the afterlife. « This is the first time that the author himself admits five years later that the entire story was in fact, a lie». The co-author of the book was Alex’s father, Kevin Malarkey. The book was recognized as the New York Times best seller and was extremely contentious among orthodox Christians in America. 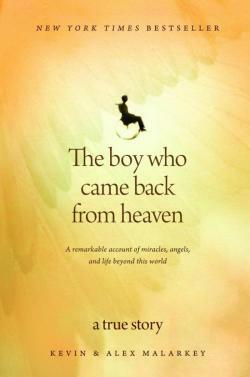 The publishing agency’s statement on the book was the following: “This novel is based on a supernatural encounter that shall provide you with valuable insights on the afterlife.” This is not the first time that the victims of these types of traumatic experiences decide to share their stories through a book. However, this is the first time that the author himself admits five years later that the entire story was in fact, a lie. Too good to be true, the skeptics were right but how could one question the honesty of a victim all the more when the victim turns out to be a six year-old child? Well, dear readers, the whole thing was a lie! The author admitted it himself: “I have neither died nor have I gone to Heaven. I thought that the book would bring me attention. I did not know that people would actually benefit from my lies. I had never read the Bible prior to writing the book, and after doing so I have come to the conclusion that the Bible is enough.” In the midst of this embarrassing story, it has been reported that the child’s parents divorced following the statement. Moreover, the book has been pulled out of the market and religious debates have resurfaced. Torn between writer’s integrity and religious belief, I am waiting for your feedback and impressions to shed some light on this issue!